The analysis in this issue is from one of the world's most independent-thinking financial analysts. In trademark fashion, Prechter provides a perspective well beyond this month's news headlines, this year's hottest stock picks, this decade's debt-fueled expansion -- even beyond living memory -- to show you where today's investment environment fits into the big picture, and how you can prepare immediately for the "surprises" still to come. It's not too late, but the doors to financial safety really are closing shut. Learn what you need to know now. 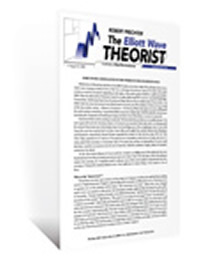 You're a few clicks away from your free 10-page issue of Bob Prechter’s Elliott Wave Theorist. Download Prechter's FREE 10-Page Market Letter. Hurry! Access expires December 6.